A study published today by researchers at Memorial Sloan Kettering Cancer Center (MSK) has concluded that simultaneous sequencing of tumor DNA and normal tissue for a broad panel of cancer-related genes may detect more potentially clinically significant heritable mutations than a targeted approach based on current clinical guidelines. The study found that more than half of inherited cancer gene mutations in people with advanced cancer were not detected using traditional methods based on family history. Those results suggest that current guidelines for genetic testing based on family history may not detect all clinically actionable genetic mutations, the MSK researchers concluded. But while knowledge of the additional mutations creates opportunities for precision prevention for patients’ families, and can help guide therapy as well as preventive interventions among family members, the researchers added that they continue to investigate whether such interventions would improve outcomes. The study, “Mutation Detection in Patients with Advanced Cancer by Universal Sequencing of Cancer-Related Genes in Tumor and Normal DNA vs Guideline-Based Germline Testing,” appears in today’s issue of the Journal of the American Medical Association. 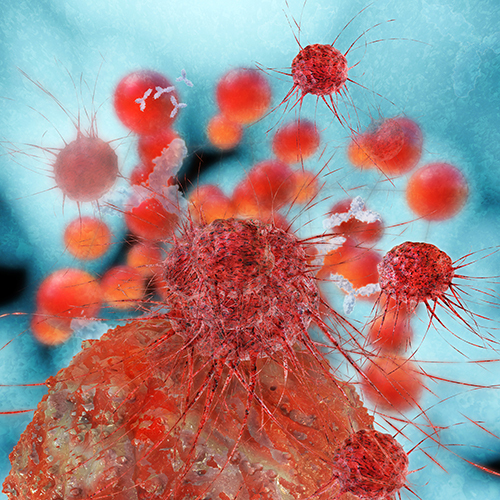 “What was surprising about this study was the large number of individuals with inherited mutations who would not have been aware of the risk to their families had we not provided them with tumor-normal sequencing at time of their treatment evaluation,” Kenneth Offit, MD, chief of the Clinical Genetics Service and Robert and Kate Niehaus Chair in Inherited Cancer Genomics at MSK, said in a statement. “At the time of a diagnosis of advanced cancer we have a vital opportunity, through comprehensive genetic testing, to set the stage for precision prevention for patients’ families. The major message for patients is that out of the challenges of a cancer diagnosis can come the opportunity for prevention in the family,” Dr. Offit said. From January 2014 until May 2016, 10,336 patients at MSK consented to tumor DNA sequencing through MSK-IMPACT™ (Integrated Mutation Profiling of Actionable Cancer Targets), a 410-gene panel designed to detect gene mutations and other critical genetic aberrations in rare and common cancers, as well as test both inherited DNA and tumor DNA. Since May 2015, 1,040 of these patients with advanced cancer additionally consented to germline analysis of 76 cancer predisposition genes. The researchers analyzed DNA samples from 1,040 patients, finding that 182 (17.5%) had mutations indicating cancer susceptibility. Of these 182 patients, 101 (55%) would not have had these mutations detected using traditional guidelines based on family history, age, and tumor type. Clinical actionability of pathogenic variants was defined by evidence of their utility in cancer prevention or their potential utility as therapeutic targets. The frequency of inherited mutations was related to case mix, stage, and founder mutations. According to the study, germline findings led to discussion or initiation of change to targeted therapy in 38 patients, and to predictive testing in the families of 13—including six for whom genetic evaluation would not have been initiated by guideline-based testing. “We found that tumor-normal sequencing facilitated personalized therapies and prevention by simultaneously detecting inherited markers of cancer risk and identifying tumor-specific genetic targets for treatments,” added pathologist Diana Mandelker, M.D., Ph.D., a co-primary author of the study along with Dr. Offit, molecular geneticist Liying Zhang, M.D., Ph.D., and genetics counselor Yelena Kemel, M.S. Researchers also found a significantly greater overall prevalence of germline mutations observed in patients with metastatic disease—a result they said may be explained through further molecular profiling and prospective studies of treatment response. Among study limitations acknowledged by researchers were physician discretion for referrals to tumor sequencing, and unique demographic characteristics of patients. Of 1,040 patients, the median age was 58, 65.3 percent were male, and 81.3 percent had stage IV disease at the time of genomic analysis, with prostate, renal, pancreatic, breast, and colon cancer as the most common diagnoses. These and other factors limit the generalizability of study findings to a community practice environment, according to MSK. The study was supported through MSK’s Robert and Kate Niehaus Center for Inherited Cancer Genomics.